The internet as you know it will never be the same. Six years after Walt Disney Animation Studios gave us the game-hopping, arcade crashing adventure Wreck-It Ralph, we once again get to revisit some beloved characters from the original in the wildly inventive Ralph Breaks The Internet. 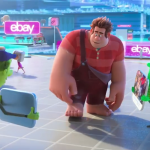 The first mainstream sequel from the Mouse House since Fantasia 2000 in 1999 (and not really counting 2011’s Winnie the Pooh) Ralph Breaks The Internet is a fun, frenetic, emotional adventure that celebrates the internet in all its weirdness and glory. It’s been six years since the events of Wreck-It Ralph, and Ralph and Vanellope have settled into a quiet life at Litwak’s Arcade, sharing stories about their day, enjoying root beers at Tapper’s, and occasionally sneaking into Tron for a friendly race. 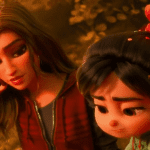 It’s all well and good, except Vanellope, in true Disney Princess™ fashion, wants more from her life than being a permanent racer in her Sugar Rush game. Things take a turn when Vanellope’s game accidentally breaks, leaving hundreds of Sugar Rush characters homeless. After a Wi-Fi router gets plugged in, Ralph and Vanellope get the bright idea of sneaking onto the internet and procuring a replacement part from – where else? eBay. The best part about animated sequels, particularly Disney or Pixar sequels, is marveling at how far animation has come in the years since. 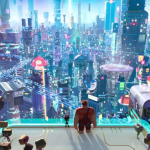 And while 2012’s Wreck-It Ralph was very well realized, Ralph Breaks The Internet is absolutely stunning to look at. The world of the internet, imagined as a massive metropolis with towering skyscrapers representing internet companies, gives Zootopia a run for its money. It’s a really special moment when you admire the creativity of the film and how many amazing internet references there are packed in. Everything from Snapchat to Google to Pinterest to Amazon to Instagram to Twitter gets its moment to shine. The internet is just the tip of the iceberg, as in true Wreck-It Ralph style, we get to spend a lot of time in various areas of the internet. Slaughter Race, a grungy, violent game that Vanellope is drawn to, is a victory for photoreal animation and gripping action sequences that put the Fast and Furious franchise to shame. We also see a little bit of the Dark Net, a place where no one should enter, in a movie or in real life. Truly the most imaginative sequence is a visit to BuzzTube, an obvious YouTube homage, where we get to see “likes” and “views” pouring in like rain. It’s hypnotizing, it’s surreal, and it’s what you’ll be thinking of the next time you watch a viral video online. Just like the first film, the animators went all out with the homages to internet culture. So we have a search engine, KnowsMore, voiced by Alan Tudyk, who is ever ready to complete sentences with auto-complete. There are moments that put the spotlight on real life moments of internet culture, such as ads in your browser and pop-up blockers. I squealed audibly when Colleen Ballinger made a cameo, and she’s hardly the only internet star in here. We learn how annoying (and dangerous) popups can be, and how notifications really work. We also get to see how hurtful hate comments can be, how easy it is to get swept up into the world of online trends, and most importantly, how fleeting internet fame can be. These are important messages to tell children, especially those young ones who feel a desire of becoming online stars. Best of all, despite the fact that there is so much internet “stuff” going on in the movie, to its credit, the film never deviates from its storyline. The voice acting, as we expect from Disney, is top-notch. John C.Reilly is lovable and awkward as Ralph, while Sarah Silverman brings on the potty humor (yes, there’s more) and childish banter through Vanellope. Surprisingly, the film’s standout performance was Gal Gadot as Shank, who is imposing and intimidating, yet someone you just want to listen to all the time. Taraji P. Henson also joins the cast as BuzzTube algorithm Yesss, who steals every scene she’s in. Jane Lynch and Jack McBrayer are also there as Sergeant Calhoun and Fix-It Felix, Jr., but we get to see very little of them this time around. At the heart of it though, Ralph 2 tells a surprisingly deep and compelling story that reminded me a lot of the parent-child dynamic of Finding Nemo. While the film didn’t resonate as highly it should have with me personally, I can see a lot of parents appreciating such a story about letting go and letting children follow their hearts. A few things, however, failed to have an impact. This film suffers from the lack of a true “Turbo” moment that we still love about the first film. It doesn’t have the emotional gut-punch that the first one did, either. Little nitpicks aside, I believe Ralph Breaks The Internet is more than capable of standing alongside the truly great Disney films of all time. 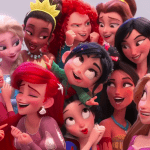 If there is one thing Ralph Breaks The Internet will forever be remembered for, it will be for bringing together all the Disney Princesses for a few amazing scenes. I was pleasantly surprised that the moments we see in the trailers are less than half of the princess moments we get in this film. Each and every Disney princess gets their moment in the spotlight, and how special it is indeed. Not to spoil anything, but after watching one particular scene, I found myself wishing that Disney greenlights an animated Disney Princess film, kind of like the Avengers. Trust me when I say that film would make $2 billion right off the bat. Vanellope herself gets a special little musical moment, with help from the Princesses and old friend Alan Menken. Watch out for a feathered friend from Enchanted to make an appearance. It was truly spellbinding and a full circle moment to see all the princesses together, conversing like best friends at a sleepover, and dishing out valuable advice. Princesses aside, the entire world of Oh My Disney, is awe-inspiring. I counted no less than fifty cameos from all kinds of franchises including the Muppets, Star Wars, Marvel and even ESPN! This small celebration and acknowledgement of the pervasiveness of Disney, was worth the ticket price alone. It’s this self-referencing humor, this self-aware sense of fun, that truly makes Ralph Breaks The Internet stand out in the Disney canon. I adored Ralph Breaks The Internet, and while I don’t think it entirely lives up to its predecessor, it’s still extremely well done. In addition, it’s an important film for opening up conversations about relationships between parents and children, particularly how involved parents should be in their child’s life. Not to mention, it’s amazingly entertaining, celebrates the internet and online culture in general, and at the heart of it all, tells a fantastic, emotional story. If this is the current state of modern Disney sequels, then we can expect great things from next year’s Frozen 2. Side note: Stay through the end credits and also till the end. You’ll walk out laughing your head off. Did you watch Ralph Breaks The Internet yet? What are your thoughts?